In this bleak portrait of an alternate future, Warren Ellis imagines the integrity of the entire planet's super-powered population as being one of two things: compromised or nonexistent. Against that backdrop, the cold war has been amplified to a terrifying degree. Rather than threatening each other with fistfuls of nuclear weapons and stern words, America and the Soviet Union have waged open war using super-humans in the place of more traditional armaments. Of course, in retrospect those warring nations may have been better off dealing with radioactive fallout. There's no controlling the emotions of these gods among men, who treat collateral damage to some of the planet's greatest treasures with the same degree of sympathy that you or I might grant an anthill. Though the series isn't told from their perspective, Warren Ellis goes to great lengths to ensure we understand just how different the mentality of these creatures really is. They're more than superior beings physically; the supergods are also in a completely different place mentally. Like Doctor Manhattan in Watchmen, the focal points of this series are difficult to relate to, which also makes them tough to predict or understand. They act in a way that might seem completely insane to you or I, but which makes perfect sense to them. India's anointed savior Krishna, for example, deals with his appointment as leader of an entire nation by wiping out 90% of its population. To the planet at large it's genocide, but to Krishna it's merely a reduction of his responsibilities to a more reasonable level. This is an occasion where Ellis's penchant for lengthy, vocab-heavy monologues actually seems appropriate. Of course, upon close inspection it's just another vehicle for the writer to share his own opinions about humanity's shortcomings (cleverly presented as the thoughts of an Earthbound god) but so long as this isn't your first experience with the work of Mr. Ellis, that shouldn't be entirely unexpected. The high concepts never stop coming in Supergod, for better or for worse. As a direct brain dump of crazy ideas, original concepts and thought-provoking natural reactions, it's fascinating material. As a gripping, cognizant narration? Not so much. Garrie Gastonny, the artist tasked with translating Ellis's loose musings into something resembling a sequential story, performs adequately. Many times it feels like he's struggling to keep pace with the big theories floating around, others it seems as though he's darted out too far ahead and has to tread water while the words play catch-up. Gastonny's work isn't particularly thrilling, especially when our attention is called to the human narrator behind this tale, but he blossoms when the focus shifts to the supernatural creatures that drive it. It takes a lot just to reign in some of this writer's ideas closely enough to realize them, and while Garrie does manage to do so effectively, he doesn't embellish and enhance that material quite as much as the series needed to be an outright success. This isn't a mass-market book. It's too cerebral, too caught up in its own deep, detailed imagination to bother worrying about the kind of readers who probably wouldn't give it the time of day to begin with. 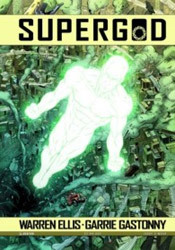 Like many of this author's best works, the real treasure of Supergod is in its concepts and theories, not in its narrative. It's a dissection of what we believe about the men and women underneath the capes and cowls, a radical alternate proposal of who they might be and what they might do on our own soil. It's truly fascinating stuff, but it's also terribly dry and plodding. If you've enjoyed some of Ellis's trippier material in the past, this was made with you in mind. If you haven't, there's nothing in these pages that's going to change your opinion. Borrow it if you're curious, it shouldn't take long to decide which camp you fall into.